I wrote this article after my homeless experience and hoped to find a publication interested in printing it (and paying me!). So far no such luck, so I think it’s safe to print it here and at least share it. If you’re interested in helping homeless families in the Twin Cities, you can still support my Facebook cause (thanks to those who already did show their support!). For more on homelessness, I highly recommend the videos at Invisible People. I’ve never been homeless. I’ve never had to wonder where I was going to spend the night. I’ve never had to contemplate sleeping in my car. I’ve never had to consider who I would call if I lost my house and had nowhere to go. I’ve never had to consider how anyone could possibly sleep outside in 42-degree weather. 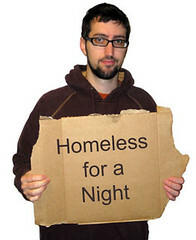 On Oct. 16, 2008 I spent the night homeless. Now in the interest of full disclosure I should let you know that I signed up for the experience. I didn’t lose my house. I didn’t have to consider sleeping in my car. I wasn’t actually homeless. I joined more than 500 teens and adults from across the Twin Cities who became homeless for a night and camped out at the Minnesota State Fairgrounds to raise cash and awareness for homelessness. Our efforts raised more than $11,000 for Families Moving Forward and Project Home, two organizations that provide emergency shelters in the Twin Cities. While many did sleep in boxes or tents and we were served a meal of bread and soup, it didn’t exactly approximate the homeless experience. For starters a musical group and a DJ entertained the teens for hours, giving them something to do and a way to keep warm. It was also voluntary and at any time anyone could have thrown in the towel and gone back to their nice, warm bed. I even had my cell phone and was sending text message updates to my Twitter account, letting my loved ones know that I hadn’t frozen yet and that despite the cold I would not do the Macarena to keep warm. But reality did settle in for me twice during the experience. The first moment came during a break in the music and dance scene when the event organizers came to the stage to talk about why we were all freezing. They played two minutes of audio that nearly brought me to tears. Those two minutes were the voices of the hundreds of men and women, moms and dads, who had called Families Moving Forward asking for emergency shelter. A single mom with a six-month-old baby. A dad and his teenage son. A family with three kids under four. All of them were in dire straits and needed a place to stay. I knew that Families Moving Forward and Project Home served primarily families. I also knew that 80% of homeless people are in need of short term, emergency help. I also knew that a growing percentage of the homeless are families with children. But the reality set in not with the cold, hard statistics, but with the frazzled voices of these parents. For whatever reason their options had been exhausted. They had no where else to turn. You could hear the desperation in their voices. This is the true voice of homelessness. It’s not the raspy holler of the drunk on the corner asking for a handout, though he could use some help, too. We’re talking about the voice of families. People with kids who had come to the end of their rope. Reality set in again at 4 in the morning. I had barely enough layers and blankets to keep warm. I had managed maybe an hour or two of sleep because every time I rolled over a sudden wave of nausea would hit and I’d struggle to keep from throwing up in the tent. My body had plotted against me and fallen ill sometime between the Electric Slide and falling asleep. At 4 a.m. I could stand it no longer, disentangled myself from my blankets and sleeping bag, found my shoes in the dark, and zippered my way out of the tent without waking my fellow homeless tent-dwellers. I went to the bathroom. I drank some water. I didn’t throw up (that came later). But I spent the next hour pacing the grounds, taking in the utter quiet of 500 people sleeping outside. I kept moving to keep warm, but also because it seemed to keep the nausea at bay. I realized in a few short hours this would be over. I could climb into my nice warm bed, I could throw up into my own toilet (and I did). I also realized that if things had gotten really bad, if I couldn’t hold it in and managed to sour the inside of my tent, I could have called reinforcements. My wife, crabby as she’d be to get that call, would have come to get me (she later asked why I didn’t call, even though things weren’t that bad). Even if my wife weren’t a saint I could have called a cab or just taken the bus. What I realized at 4:30 in the morning, pacing a sidewalk at the Minnesota State Fairgrounds, where Ford displayed their F-150s a few months ago, is that I had a place to go and people to call. If a real homeless person were sick in the middle of the night, they had no place to go or person to call. Even if they were in a shelter, they’d have to cling to a strange pillow, hobble to a strange bathroom. They’d have to be miserable in a strange place. They’d be exposed and weak and all the things you are when you’re sick without any of the comforts we all take for granted. My kitchen may not be well stocked, but I knew at the very least there’d be some stale crackers for when my stomach was ready to try food again. Homeless families don’t even have the minimal comfort of those stale crackers. These two moments of reality humbled me. My homeless experience was hardly realistic. It’s safe to say that I did not experience anything close to true homelessness. But I began to understand what it might be like to have no options. To have no family or friends to turn to, no savings account or credit card to get you through the night. Homelessness is a rough gig. With our cratering economy homelessness is going to get worse. Families Moving Forward has gone from 25 calls a month to 300 asking for emergency shelter. Even before the stock market took its dive there were tent cities of homeless people popping up across the country in places like Seattle, San Diego, Portland, Columbus, Reno, Chattanooga, Fresno and more, people made homeless by foreclosures and rising prices. People who lose their jobs will turn inward to take care of their own. Already strapped nonprofits will have to cut back. It starts to sound ugly. Project Home provides emergency shelter for the homeless in church basements. If anyone can answer the cry of the homeless no matter the economic conditions, it should be the church. After all, we serve a homeless transient who never had a place to lay his head. Jesus was homeless, too. Hey Kevin, we’d be interested in running this on our online magazine as a re-print. We’d, of course, link back to you (no money though, sorry). Email me and let me know. A school in Dallas hosted an event similar to this to raise money for their homeless shelter. Unfortunately, I was unable to get details from them as to what went on at the event. I moved from East Oakland California to the suburbs of Houston TX where the more sheltered population of Houstonians live. The contrast in the poverty level between these two places never cease to baffle me. I am a senior in High School, and the majority of the student body come from decent homes and most of them take this for granted. When exiting the freeway, in whatever weather–it’s often that we see a homeless person beneath a bridge. Yet, for many passerby, its normal–they aren’t affected by it at all because they don’t understand it. They can’t. How can they understand? How can I REALLY understand? I am looking to host a Homeless For A Night Event in an effort to raise awareness about the danger the homeless face and to raise funds to aid the homelessness. I was hoping you can give me some details about the organization of the night, issues the speakers addressed, How the event came about, ideas on how to raise the funds, and how to get 500 people committed to this idea of sleeping in 42 degree weather.